I had another busy day planned out for myself. I planned on going to the Beijing HuTong Tour, TianAnMen Square, Forbidden Palace, BeiHai Park, and WangFuJing. My first stop was the famous Beijing Hutong Tour. I got up early in the morning about 7:30am, and started my day off with a very traditional Chinese style breakfast, which consisted of a bowl of soy bean milk, and 4 steamed pork buns, which cost me only $3 yuan, or about 35 cents USD. A main street leading to the Hutong in Beijing. Good question. Hutongs are actually not unique to Beijing city, but there are Hutongs all over China. In the old days, many localities in Chinese cities had hutongs, or a narrow alley or narrow street. On the sides of these narrow streets are residential houses. Today, much of the old, existing Hutong in China have been demolished to make way fro skyscrapers and other large buildings. The Beijing Hutongs are well preserved, and has a nice setup for foreign tourists. There are businesses setup that employ tricycles that take you on a tour through the Beijing Hutong. 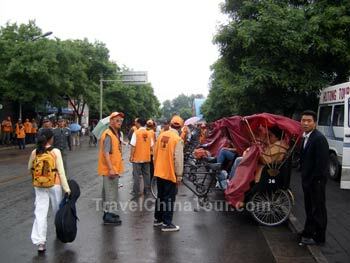 In the photo above, you can see the long line up of tricycles employed by a company named "Hutong Tour". There are probably hundreds of individual owned tricycles that try also to sell Hutong tours, but I'm not sure how reliable they are. So if you ever decide to visit the Beijing Hutongs, take the tour from the "big business" that's setup on the main street. 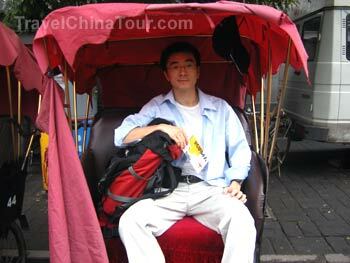 Sitting in a tricycle, I was getting ready for my Hutong Tour. The departure point for Hutong Tours is at the intersection of Di An Men Xi Da Jie and Qian Hai Xi Jie. You can call them for reservations dialing locally: 66159097, 66123236, or 64002787. I just went there without a reservation, and there were plenty of guides available. But during peak season, perhaps it might be a good idea to call ahead of time. 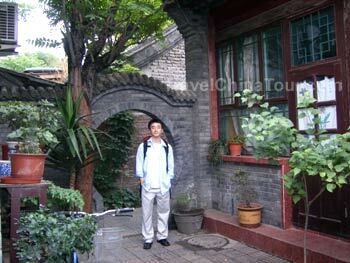 I purchased a Beijing Hutong Tour ticket (as you see me holding in the photo above), and it cost me $80 yuan. I was told that the tour would last about 1 hour, but in the end, it lasted just about 40 minutes. Probably for larger groups it would take slightly longer. As we started the Hutong Tour, the first landmark site that we came up on is the Guo Moruo Museum, which is the former residence of the Chinese cultural giant Guo Moruo (1892-1978). Another group of Hutong Tourists. A typical Hutong in Beijing. The tour guide, took me through several winding Hutongs, explaining things as we went along. Most of the buildings on the two side are traditional residential buildings. 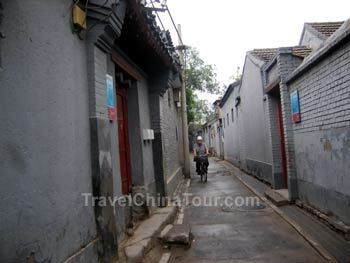 As you can see from the photo above, the Hutong is quite narrow, just wide enough for two bicycles to get through. Here's me inside the courtyard of the residence of Jimmy Jing. Edit: I found his card. :) the address is #12 Dajinsi lane, Gulou Street, Beijing, China 100009. You can reach him at 86-10-661-856-60. After spending about 15 minutes visiting his home, and chatting with Jimmy Jing, I was on my way again to complete my Hutong tour. Luckily, it rained this morning, so the weather was rather nice and cool, so I was wearing a long sleeve. 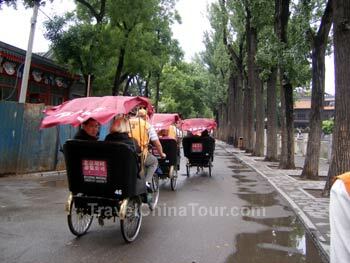 The guide had brought me back to the departure point, and I was done with my Beijing Hutong Tour. Off I went to see TianAnMen Square.